The Low-Down: Is Blockchain Just the Latest Pixie Dust For Stocks? 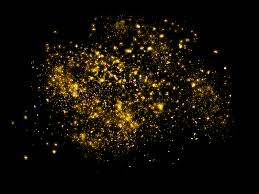 Is Blockchain Just the Latest Pixie Dust For Stocks? As bitcoin soars by more than 700% and a flurry of new digital tokens spring up the market (is) ballooning to $260 billion in market capitalization from just $17 billion at the start of the year. The moves remind some of the 90s dot-com bubble, where all a company had to do was add ".com" to its name in order to pump its stock. Blockchain businesses argue this time it’s different. A market truism for our time is that whenever a company touches anything related to blockchain -- or claims to -- its stock shoots up, sometimes even before it enters the industry. The latest example? Riot Blockchain Inc., formerly known as Bioptix Inc. The former maker of diagnostic machinery for the biotech industry (a penny stock with three reverse splits in five years) now invests in cryptocurrency-related businesses, leading its stock to more than double just since Nov. 16, when it bought a minority stake in audit and accounting firm Verady LLC. 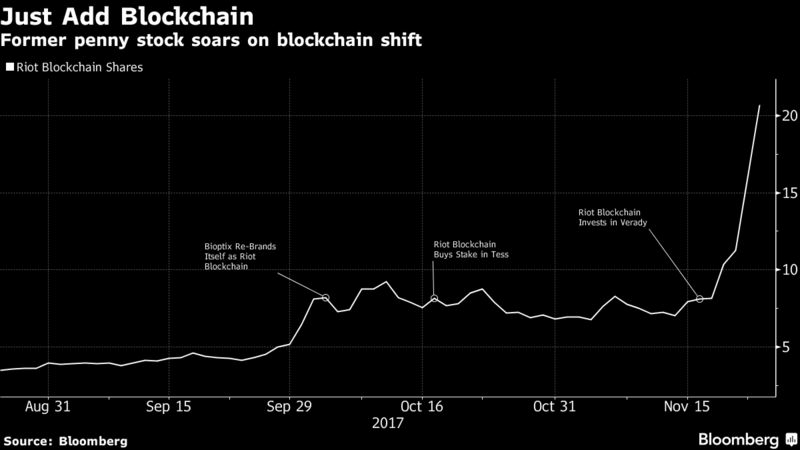 That merely added to gains since renaming itself and buying a stake in blockchain-based payments provider Tess Inc. in October. Meanwhile, cyprocurrency king bitcoin has remained uncharacteristically steady at around $8,100 for the past week. The reaction reflects huge investor interest for exposure to this year’s cryptocurrency rally, as bitcoin soars by more than 700 percent and a flurry of new digital tokens spring up, with the market ballooning to $260 billion in market capitalization from just $17 billion at the start of the year. Bitcoin derivatives have yet to start trading on a major exchange, exchange traded funds haven’t been approved and there’s only a handful of trusts and notes holding digital assets, so blockchain-related stocks provide an alternative for investors who want in on the boom but are wary of buying cryptocurrencies directly. Another example is 360 Blockchain Inc., a private equity firm formerly known as 360 Capital Financial that changed its name last month, saying it plans to focus its investments on blockchain-related companies. That drove its stock up 300 percent. And the list goes on. Overstock.com Inc. soared after announcing the launch of a Securities and Exchange Commission-compliant digital tokens exchange. 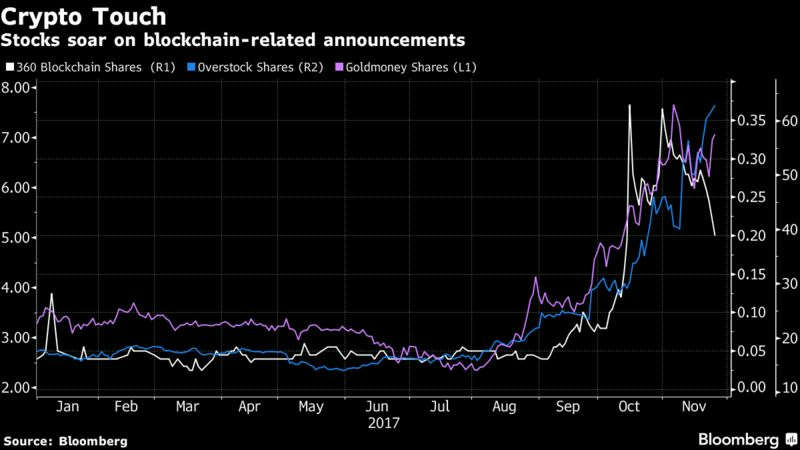 Goldmoney Inc. jumped after saying it will offer its clients the ability to trade bitcoin and ether and store the assets in auditable and insured vaults. The moves remind some of the 90s dot-com bubble, where all a company had to do was add ".com" to its name in order to pump its stock. Blockchain businesses will argue this time it’s different.